What is Kagura? Why are they dancing? Kagura literally means entertaining the gods. 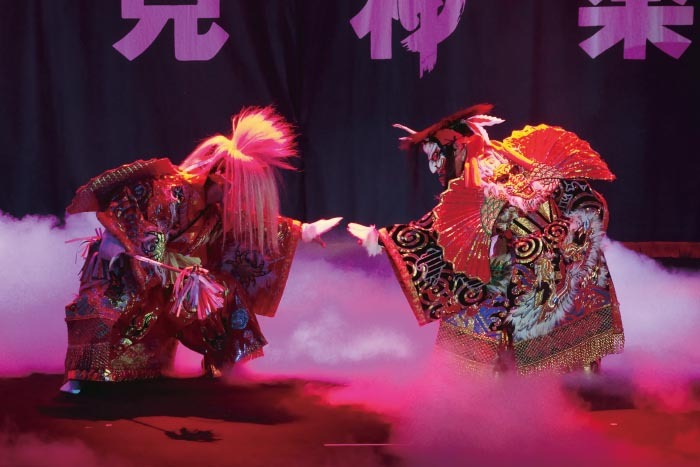 It is a sacred Japanese dance and music ritual dedicated to the gods of Shinto. Since ancient times, it has been performed at regional festivals as a ceremony to pray for a good harvest and to ward off natural disasters. The origin of kagura is not accurately known but it is believed to originate in the Amano-Iwato story, which is one of the myths described in Japan's oldest historical record, Kojiki (written approximately 1,300 years ago). In this story, Amaterasu Okami (God of the Sun) hides behind a rock. Many gods dance and play music hoping to coax her out to shine light on the world again. Kagura spread throughout the country in various ways, giving birth to many forms of performance. Each region has enjoyed its own form of kagura for many generations. What makes Iwami Kagura unique? 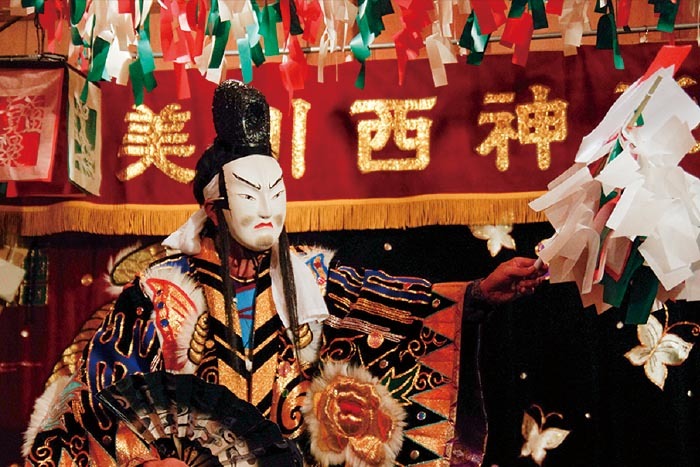 Kagura, which began as a religious ritual, has also been a popular form of entertainment for centuries. But, with the spread of urbanization and regional changes, kagura rituals have not been passed down to successive generations and it is rarely seen in urban areas. The image of kagura has changed and many people have come to see it simply as a difficult-to-understand ritual. However, Iwami Kagura has continued to evolve and remains very popular in this region. Some notable features of Iwami Kagura are fast-paced music and dance, gorgeous costumes and simple stories. 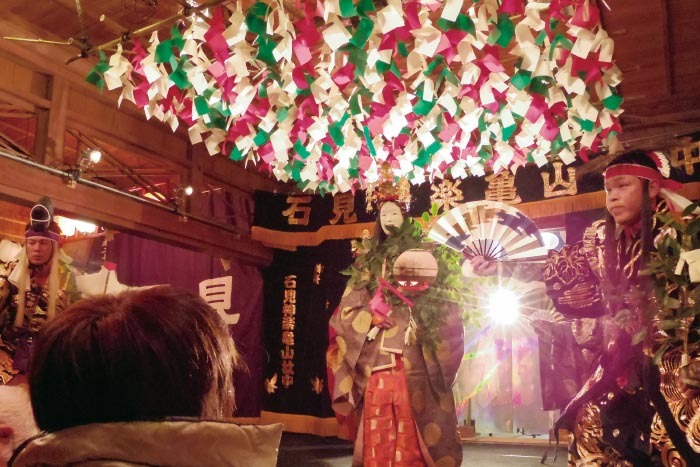 In Iwami, there are more than 130 active kagura organizations, known locally as shachu. Iwami Kagura remains a well-established part of daily life in this area. We hope you will find it exciting and fun! 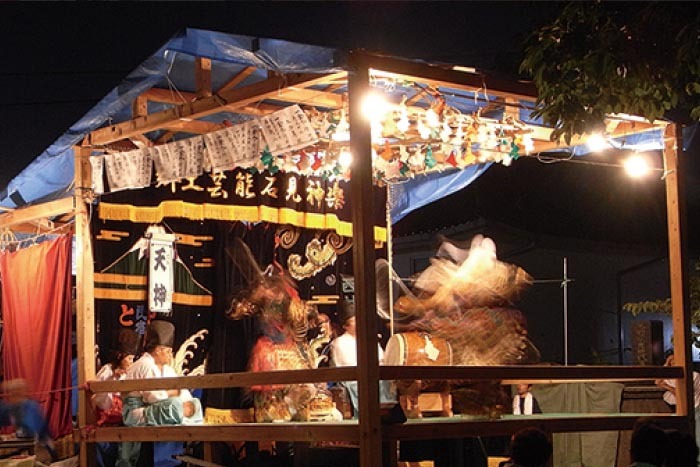 Kagura is a majestic dance ceremony that relates a story. Performances usually consist of a simple theme, gods eliminating demons. These simple stories of gods defeating demons are based on myths from Kojiki and other early historical documents. These myths are believed to originate from the religious belief that demons caused droughts and flooding and that, through prayer, the gods could defeat these demons. The meanings of the phrases repeated throughout each play are difficult to understand. However, the most important thing is to enjoy the overall flow of the performance. 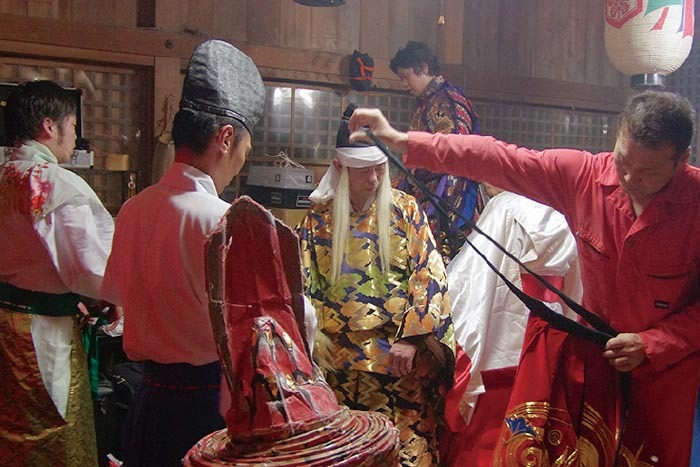 Usually, kagura is performed by local citizens who practice in the evenings and on weekends. These volunteer groups are invited to perform at local festivals and gatherings. 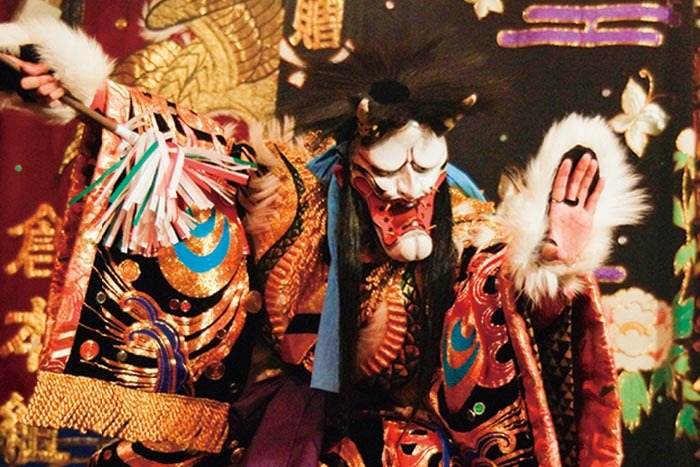 Men traditionally performed Shinto rituals so most kagura performers are male. However, it is becoming more common to see women performing as well. Children also love kagura. There are children’s kagura groups and some schools include kagura as part of their curriculum. Some people fall in love with kagura as children and continue to be involved with it as adults. 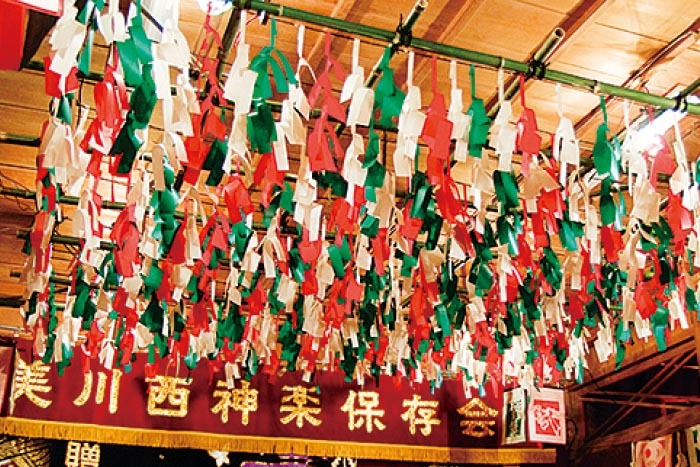 A square-shaped bamboo frame with shide (zig-zag paper streamers) and sakaki (evergreen tree sacred to Shinto) branches to represent the sacred Shinto area. Kagura i s performed within this area, with each of the four corners representing a different direction (north, south, east and west). A special stage built for the day’s p e r f o r m a n c e . S p e c t a t o r s s i t surrounding the stage. Special coatings are applied to the floor of the stage to help stop performers from slipping. *Often a small sign on the side of the stage or curtain shows the name of the current story. You can compare it with the Japanese titles listed in this pamphlet to identify what story is being performed. 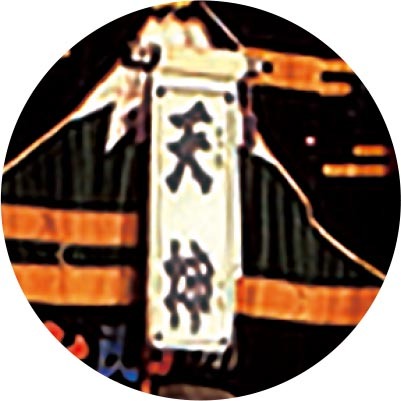 The hero of Iwami Kagura and the target of children’s aspirations; usually carries a hei (Shinto staff with paper streamers), sword or bow and arrows. D e s p i t e b e i n g a d e m o n , t h i s character’s showy movements and behavior make him just as popular as the gods; usually has an onibo (demon stick). 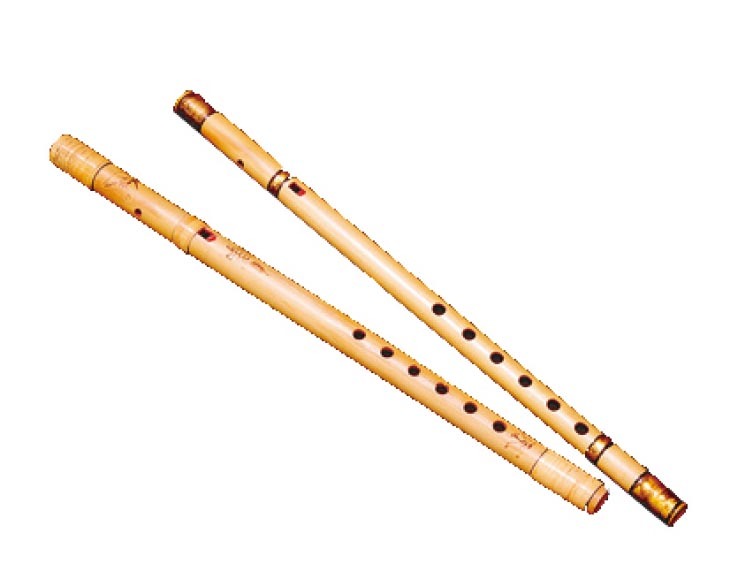 The six-hole flute leads the overall musical performance by playing the melody. 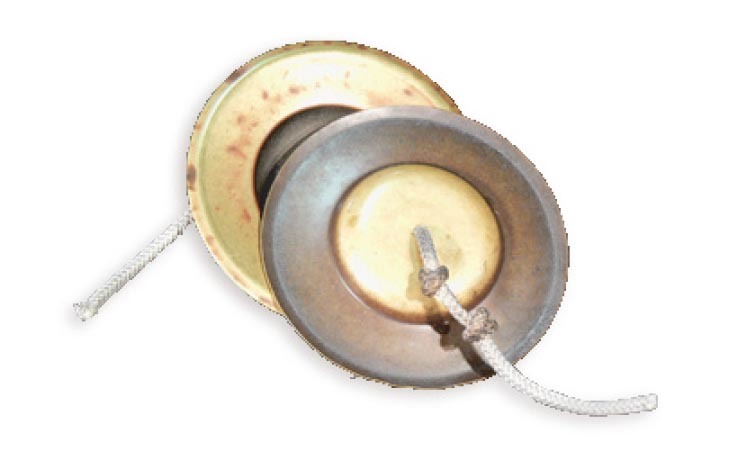 Palm-sized metal cymbals are rubbed back and forth to keep the rhythm. 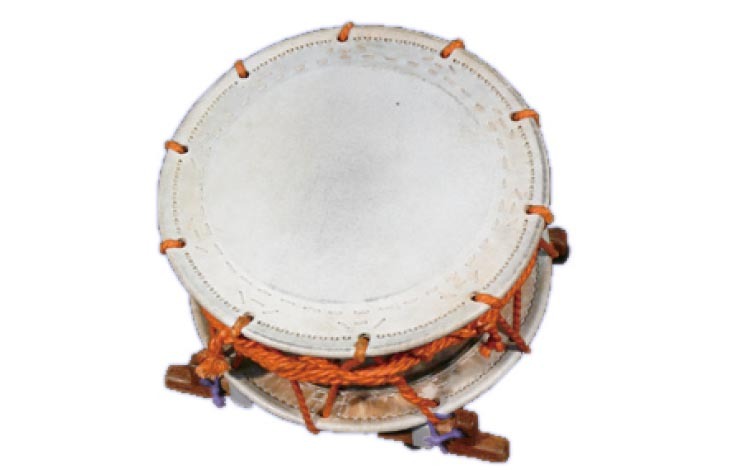 Leads the rhythm and is played with a wrist-snapping motion; the most technical part of the ensemble. 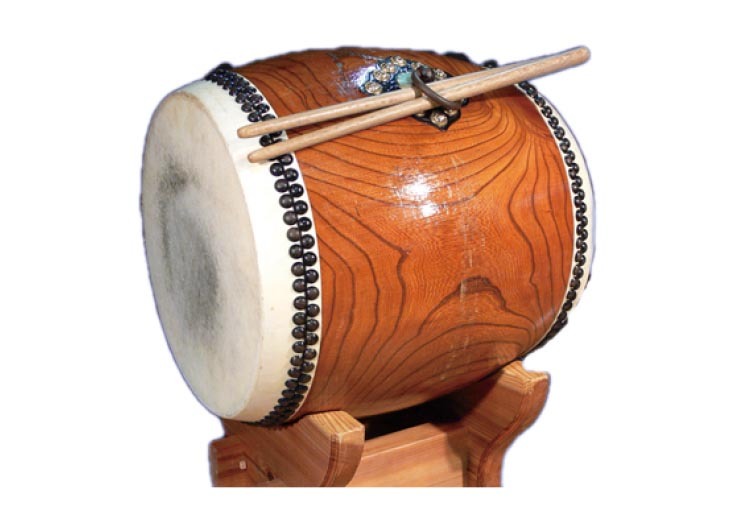 The most important instrument for leading the stage performers; played by a skilled member of the kagura group, this person also sings the accompaniment. Four people spend one month creating a single costume. 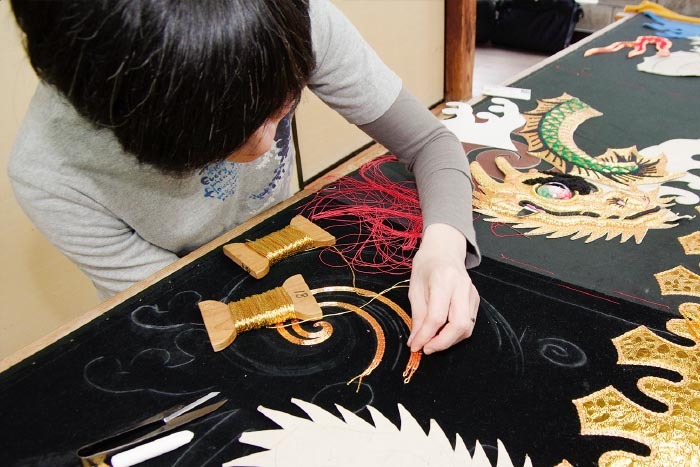 Real silver and gold thread is used for embroidering. Every piece of each costume is handmade. A single costume can weigh up to 20 kilograms. Performers must move vigorously on a small stage despite tight, heavy costumes. Therefore, they must be highly skilled and have considerable endurance. Costumes are designed so they can be altered as a performance proceeds. Watch for how the costume changes in a flash as the performer spins. 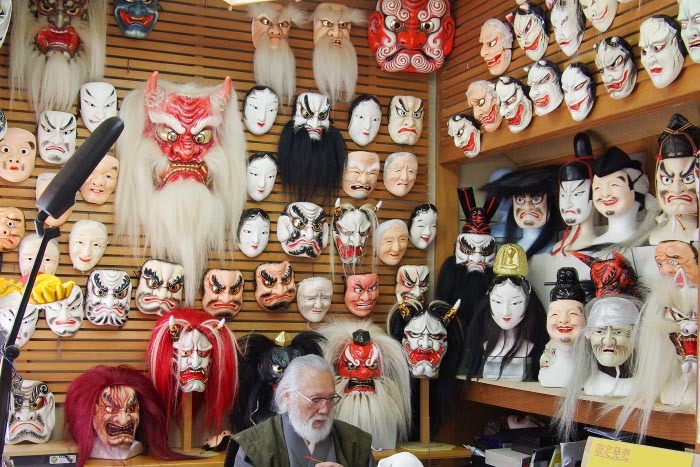 Each kagura organization makes its own original masks. They are made by gluing together overlapping layers of Sekishu washi paper (a UNESCO designated cultural heritage product). One mask takes one month to create. Traditionally, masks were made from wood. Today, they are created from paper, which makes them lighter and easier for the performers to breathe. Visibility is still severely limited. God masks have closed mouths. Demon masks have gaping mouths. 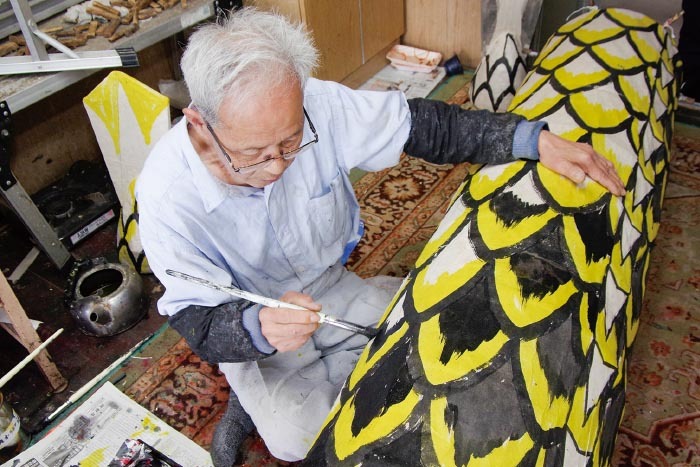 A serpent body is created from Sekishu washi paper and bamboo that was dried for a year. When fully stretched out, the body reaches a length of 17 meters and weighs 12 kilograms. A serpent body is constructed in a method similar to a mask by gluing together overlapping sheets of washi paper, which makes it strong but lightweight. ●There is no set dress code so please feel free to come in comfortable clothing. Winter nights can be cold so dres s warmly. ●When kagura is performed at a shrine, you should bow and r e m o v e y o u r s h o e s b e f o r e stepping up into the shrine. ●You may sit anywhere it is easy t o s e e w h i l e t a k i n g o t h e r spectators into consideration (moving over as others arrive, etc.). ●You will not be able to eat or drink at some venues. Do not hesitate to ask a nearby staff member if you have questions. ●The highest form of compliment for a performer after a vigorous dance is to clap, shout and whistle. It is also acceptable to cheer during a performance! ●Onhana, flower money, is an offering and expressi o n o f gratitude given to a local kagura organization. 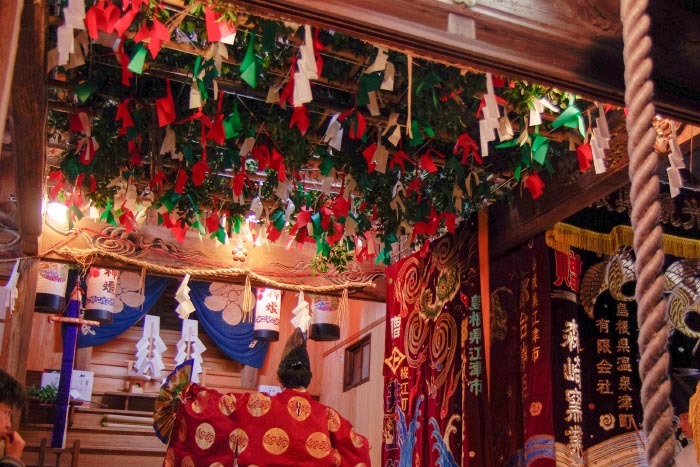 Some Japanese people give ¥3,000 to ¥5,000 when attending ceremonial kagura at their local shrine. If you happen to attend ceremonial kagura and feel the performance was outstanding, a donation would be welcomed. However, you do not need to give onhana if you are attending one of the kagura performances listed on Iwami Kagura page 8.